To say that my great-great grandfather, James Thomas Cofer, was somewhat of a character would be an understatement. I’ll bet you can name a local merchant from your hometown who made a name for himself through some catchy gimmick or nickname. Whether it’s a car salesman, a used furniture store, or a local diner, many independent merchants rely on funny names or catchphrases to bring in business. Well, James was no different. 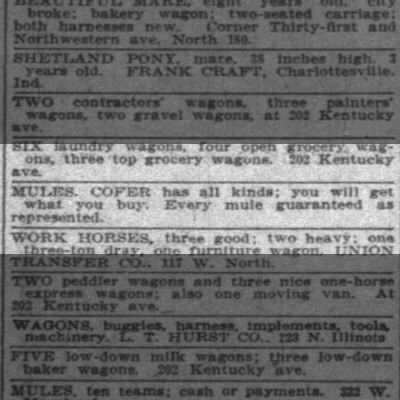 Self-dubbed the Mule King of Kentucky, he made his fortune selling, you guessed it, mules. And he didn’t limit it to Kentucky, either. Some time between 1880 and 1900, he and his family moved to Indianapolis, which brings us to the Great Pigeon Case of 1914. Sounds like a line from a movie, doesn’t it? In any case, the judge heard the evidence and “took the case under advisement.” I can’t find anything on the final outcome of the case. The lesson from this Thriller Thursday: Don’t threaten people from Kentucky! This entry was posted in Ancestor Spotlight, Thriller Thursday and tagged James Thomas Cofer, Kentucky. Bookmark the permalink. ← What is a Hoosier? ?